The high-rise building collapses in New York City on September 11, 2001 (9/11) are the subject of a new paper by four authors who are well known in the field of 9/11 scientific research.The authors are Steven Jones, Robert Korol, Anthony Szamboti and Ted Walter. The name of the paper is 15 Years Later: On the Physics of High-rise Building Collapses. The paper was published by Europhysics News, the magazine of the European physics community with a current circulation of about 25,000 copies per issue and a much wider readership.The paper immediately attained widespread interest, with almost 350,000 views to date. See the section Paper Arouses Controversy below. The paper’s focus is on the World Trade Center Twin Towers (WTC1, WTC2) and Building 7 (WTC7). The paper begins by pointing out that the failure, supposedly from fire, of these three steel-framed buildings was unprecedented, nor has any such failure due to fire in a steel-framed building been repeated since 9/11. A growing number of architects, engineers, and scientists are unconvinced by the government’s explanation as presented by the National Institute of Standards and Technology (NIST). Prior to 9/11 and since then, the only known way to completely collapse such buildings is through a procedure known as controlled demolition, whereby a building is wired with explosives designed to bring it down. The paper discusses ways to prevent high-rise failures and the techniques of controlled demolition. It presents separate case studies for WTC7 and for the Twin Towers, and includes a discussion of theoretical papers by civil engineering professor Zdeněk Bažant and others. 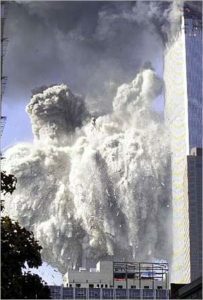 In a final section, the paper presents physical evidence ignored and unexplained by NIST, such as the “midair pulverization of most of the towers’ concrete, the near-total dismemberment of their steel frames,” and “the ejection of those materials up to 150 meters in all directions.” Also noted is the unexplained presence of molten metal prior to collapse and in the debris, and the presence of unreacted nano-thermitic material in multiple independent WTC dust samples. The paper concludes that the evidence points overwhelmingly to controlled demolition as the real cause of the building destructions. The paper immediately attained a wide readership numbering almost 350,000 views to date. For the current number of views, see METRICS. In an editorial note published with the paper, the Editors gave their opinion that the paper contained “some speculation” and that the article content was “the responsibility of the authors.” The next issue of Europhysics News following publication of the paper contained four letters, including an unexpected and stunning letter to the editor by a former employee of NIST, Peter Michael Ketcham, who worked at NIST from 1997 until 2011. Ketcham, who did not contribute to NIST’s World Trade Center investigation, recently began reading the NIST WTC reports and watching documentaries challenging NIST’s findings. In his letter, Ketcham states that the more he read, “the more it became apparent that NIST had reached a predetermined conclusion by ignoring, dismissing, and denying the evidence.” He ends his letter by calling upon NIST to “blow the whistle on itself now” before awareness of the “disconnect between the NIST WTC reports and logical reasoning” grows exponentially.Ketcham elaborates on his awakening in an interview available as part of a Youtube video. Three other letters in this issue of Europhysics News also address the paper. A letter by José Zorrilla, a structural engineer in Uruguay, supports the NIST findings but never mentions any of the evidence ignored by NIST. For example, in the case of the Twin Towers, NIST ignored all visual and other evidence that appeared after the Towers began to collapse, an unconscionable breach of the scientific method and in itself a compelling indication of fraud. In the case of WTC7, NIST never explained the period of free fall shown by physicist David Chandler, a member of Scientists for 9/11 Truth. Previously, NIST had stated publicly that, for a collapse under gravity as NIST had proposed, free fall would violate the laws of physics. The Editors themselves wrote a letter that indicates a sudden loss of editorial transparency or integrity in the process. No doubt the editors will have come under considerable fire from those governments and institutions opposed to an honest investigation of 9/11. The Editors admit their prior awareness of the “controversial conclusion” of the paper, namely, that the three buildings were brought down by some form of controlled demolition. The Editors state that they “considered that the correct scientific way to settle this debate was to publish the manuscript and possibly trigger an open discussion leading to an undisputable truth based on solid arguments.” After triggering such a debate, the Editors now appear to be withdrawing from this high standard of scientific inquiry by stating: “It is shocking that the published article is being used to support conspiracy theories related to the attacks on the WTC buildings. The Editors of EPN do not endorse or support these views.” This is a most regrettable act and development on the Editors’ part. This withdrawal from their former high ethical stance may have been triggered by the fourth letter, a letter from NIST that the Editors themselves solicited. In a fourth letter to the Editors, Michael E. Newman, Senior Communications Officer of NIST, stands by the NIST investigations and recounts NIST’s well-known findings that the collapses were primarily due to fire. Newman also gives an account of some of the building code changes resulting from the NIST investigations. Newman never mentions the evidence ignored by NIST, evidence that is now widely acknowledged and increasingly familiar to independent professionals and the public. It is to be hoped that this paper with its widespread readership and the debate that it has now ignited, will continue to spread its message “exponentially” as predicted by former NIST employee, Peter Michael Ketcham. Steven Jones is an organizing member of Scientists for 9/11 Truth and is known for his work on cold fusion at Brigham Young University where he was a full professor of physics. Besides founding the Journal of 9/11 Studies, Jones has made significant contributions to 9/11 research as author and co-author of papers such as “Why Indeed Did the World Trade Center Buildings Completely Collapse,” , “Extremely High Temperatures during the World Trade Center Destruction” , and “Active Thermitic Material Discovered in Dust from the 9/11 World Trade Center Catastrophe” . Robert Korol is professor emeritus of civil engineering at McMaster University and a fellow of the Canadian Society for Civil Engineering. He is lead author on two peer-reviewed scientific papers on the destruction of World Trade Center Building 7 (WTC7). These papers, Performance-based fire protection of office buildings: A case study based on the collapse of WTC 7 and The collapse of WTC 7: A re-examination of the “simple analysis” approach were published in the Challenge Journal of Structural Mechanics in July 2015 and February 2016. Anthony Szamboti, a mechanical design engineer, has over 25 years of structural design experience in the aerospace and communications industries. He has authored or co-authored a number of papers on the WTC high-rise building collapses. His papers, such as The Missing Jolt: A Simple Refutation of the NIST-Bazant Collapse Hypothesis are published in the Journal of 9/11 Studies and in the International Journal of Protective Structures. Ted Walter is the director of strategy and development for Architects & Engineers for 9/11 Truth, a nonprofit organization representing more than 2,500 architects and engineers, and many thousands of other signers of their petition for a new investigation of 9/11. In 2009 and then again in 2014, Ted Walter acted as executive director of two ballot initiatives in New York City for a referendum that, if passed, would demand that the city Department of Buildings investigate the collapse of WTC7. The 2014 initiate, called the High-Rise Safety Initiative gathered 53,000 signatures, nearly double the required number. In both cases, the courts denied the initiatives which never appeared on the ballot. In 2015, Ted Walter authored AE911Truth’s booklet, Beyond Misinformation: What Science Says About the Destruction of World Trade Center Buildings 1, 2, and 7. He holds a Master of Public Policy degree from the University of California, Berkeley.